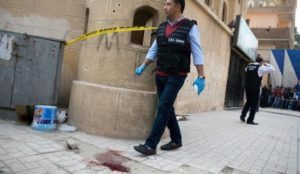 Friday’s attack appears to have taken place when police patrolling the church noticed two men behaving suspiciously, reports the BBC’s Radwa Gamal in Cairo. They approached the men, who began firing. There are reports that several people were wounded, two critically. According to our correspondent, the explosives belt discovered on the dead assailant suggested an even more deadly attack was planned. Egypt’s Copts have in the past accused authorities of only token gestures to protect them and this incident will not help calm tensions, she says…. Previous PostSo what’s happening in Iran?Next PostGermany 2018: Safe Spaces For Women?